Appolinarie had to flee her home in Ruanda during the genocide. She shares her incredible story with Tim Coleman, who brings the words and pictures. "Run and don’t look back!" It’s evening and Appolinarie, who is heavily pregnant, runs out the back of her house, under the fence and scrambles through the bushes with her sister. Behind them, shouts and screams pierce the quiet of the night. Their family is being dragged out the neighbouring houses one by one, hacked with machetes and beaten. This is southern Ruanda, in July 1994. After running a while into the evening, Appolinarie collapses to the floor and passes out for several hours, drenched by the incessant rain. Her sister wakes her and encourages them to continue through the undergrowth to the next village. At each village they come to and whichever direction they travel, the story is the same. Brutal violence and killings. They must keep moving. Appolinarie and her sister know the area well so they can move inconspicuously away from the built-up and exposed areas where they might encounter trouble. They don’t know who they can trust. Along the way they stop at her aunt’s house, but again they are encouraged to keep moving in order to preserve their lives. The journey on foot to safety in Burundi is long and hard, especially for a heavily pregnant Appolinarie. They are taunted. They pass by dead bodies. They witness looting and killings first hand. She wants to give up, surely death is better, but finds the strength to continue. A month after fleeing her home, Appolinarie is reunited with her husband and together with her sister they cross the river into Burundi. Exhausted. Depressed. This is where she gives birth to her firstborn. Safety in Burundi was just an illusion, however. The conditions were no better from where they fled, with the militia and locals in violent clashes. So, with her 3-week-old baby and her sister, Appolinarie started the even longer journey to Tanzania. In Tanzania there were three camps for refugees like Appolinarie, the place where she would spend the next two years of her life. There were many people in the camps all with stories of hardship, coping with life together in the tough environment of the camps. Appolinarie was already trained in social sciences and spent many of her days in the camps helping other young ones deal with their trauma. Even in this place she could earn a living. They searched for lost family members. Now again she received news of her family left behind. Many, like her grandmother, did not make it. Those screams from where she fled in the beginning were final ones. Then came the day when she hears word that her younger sister is in the camps. After a long search, she is reunited with her long lost sister. 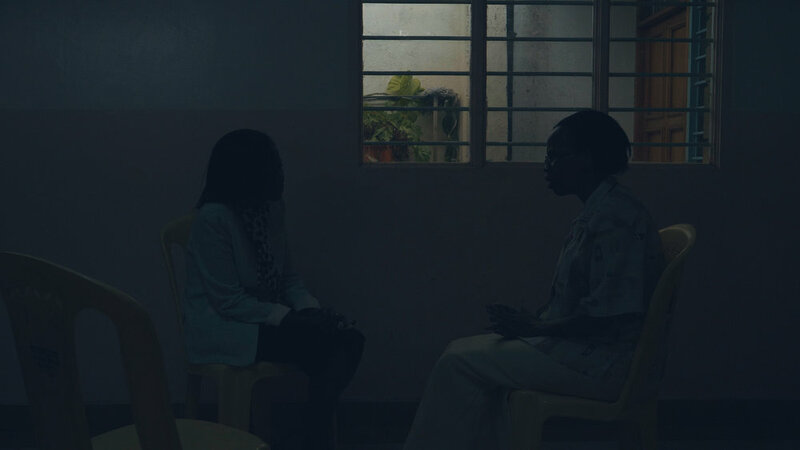 Their joyful reunion soon makes way to sadness as the sister recalls the accounts of her traumatic experiences. She has been raped on several occasions, by men she can name. She has witnessed brutality of the Ruanda genocide at its very worst. And all on her own. She travelled alone. Appolinarie had been able to suppress her own experiences, but it was a different story with her little sister’s trauma, for whom she carried a heavy burden and guilt. Her little sister died from sickness in the camps in Tanzania, carrying all that pain. The feelings of guilt, pain and anger consumed Appolinarie. She blamed herself for her sister’s experiences and even her death. Later, even through her own therapy and becoming a born again Christian, Appolinarie continued to carry her sister’s memories. In 1996, the Tanzania government closed the camps, meaning the many refugees living there were forced to move on again. Early in 1997, Appolinarie arrived in Nairobi, Kenya. It’s in the country’s capital 20 years later, that we sit and speak today. In the relative safety of Nairobi, at first Appolinarie struggled to adapt. Learning Swahili was tough, especially as she was carrying trauma and living with the memories of war. For four years Appolinarie lived day to day, disoriented and without hope for the future. In 2001, Appolinarie rekindled her passion for helping others in their trauma, in the way she did in the Tanzania camps. Later, she commenced a two-year counselling training and learned all the techniques and theories. She was now equipped to counsel others like her, of which there are many in Nairobi even today. Although Appolinarie processed a lot of her pain through counselling, she was still not ‘fully’ healed. One day at the church she was attending, a Kenyan missionary from SIM called Thaddeus visited and he was introduced to her by the church pastor. Thaddeus and another SIM worker called Faustin, also from Ruanda, spoke about a trauma healing groups run by SIM in Nairobi and invited her to attend. Where she had received part healing through counselling, the ‘spiritual’ part of SIM’s trauma healing groups would prove to change her life. Appolinarie describes trauma counselling without the word of God as ‘not enough’. There are the spiritual places that counselling theories cannot reach. Yet even as a born again Christian, Appolinarie did not have full healing, until the trauma healing groups. Two parts to trauma healing groups transformed Appolinarie; taking the pain to the cross and forgiveness. These were key in bringing about the healing she needed in order to move on in life. Before she took her pain to the cross, Appolinarie would still have nightmares. Situations where the memories of war came flooding back. Such as the time when she was most afraid, fleeing her home amidst the screams of family members as they were dragged out of their houses. Before she was able to forgive, Appolinarie could see the people killing others along the road, the stealing and looting, those that hurled insults her way. She carried all those fears, burdens and ill-feeling towards the perpetrators, until by God’s grace she was able to forgive. She carried guilt of her sister’s pain and death, until she was able to forgive herself. Healing is a process and even now she is still in the process of healing, though she no longer carries the burdens of war and can live her life. There is no pain or trauma that is too big for God to heal.